Over the summer an enthusiastic team of volunteers worked alongside our archaeologists to record the inscriptions of over 350 gravestones associated with St James’s burial ground in Euston, London. The gravestones are being studied for the HS2 archaeology programme. In this blog Community Engagement Officer, Paul McGarrity, tells us more. The gravestones we were tasked with recording are a treasure trove of valuable biographical information. This information will now be used alongside evidence from archaeological excavations at the site to build a more complete picture of the population that lived and died in the Parish of St James’s Piccadilly during the late 18th and early 19th centuries. Whilst exploring the gravestones the volunteers charted the relationships of certain families across generations and discovered addresses, job titles and in one instance an account of an individual’s death following a fall from a chaise (which we all learned together was a kind of carriage not, as was everyone’s first thought, a chair based accident). The recording work required incredible attention to detail as the volunteers measured, photographed, drew and transcribed each of the gravestones to gather the maximum amount of detail possible. On occasion, the inscriptions had been heavily weathered and so the careful application of muddy water (which pools in shallow recesses) was used to reveal the memorial inscriptions. 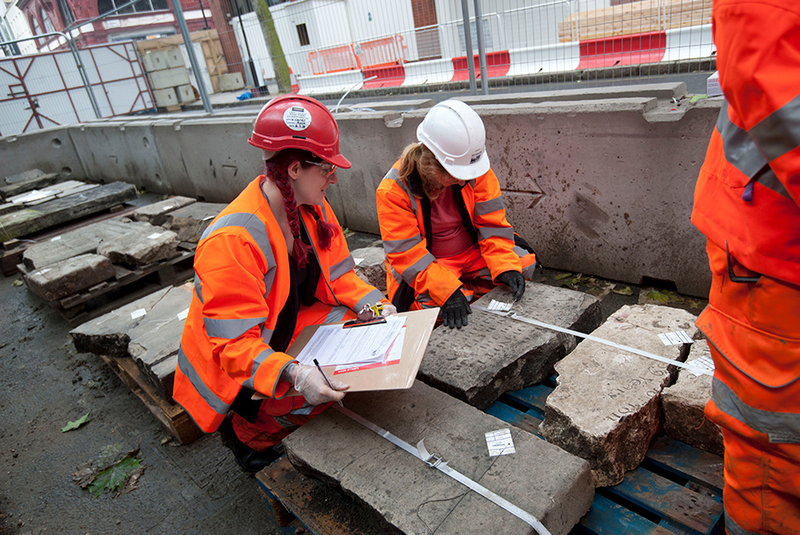 As well as supporting the work of our archaeologists as we try to understand more about the lives of the people of St James’s Gardens, this project was an opportunity for members of the public to experience first-hand how archaeology is carried out on a live construction site. Whilst this is an environment in which much of the UK’s archaeology is undertaken, health and safety regulations mean it is rarely one that is open to the public. In this instance all of our volunteers were fully inducted, wore full personal protective equipment and joined daily site briefings. By recording and understanding the information on these gravestones we are helping to tell the stories of the people buried there, people like a woman who had lived on Oxford Street in Weybridge, or a man whose gravestone declared him to be an ‘Artist’. As the project continues we will learn more about who they were, how and when they died but, more importantly, how they lived. One of our volunteers, Fiona, summed up the general feeling of those involved – both professionals and volunteers – when she said she had enjoyed “being a part of such an historic project”. 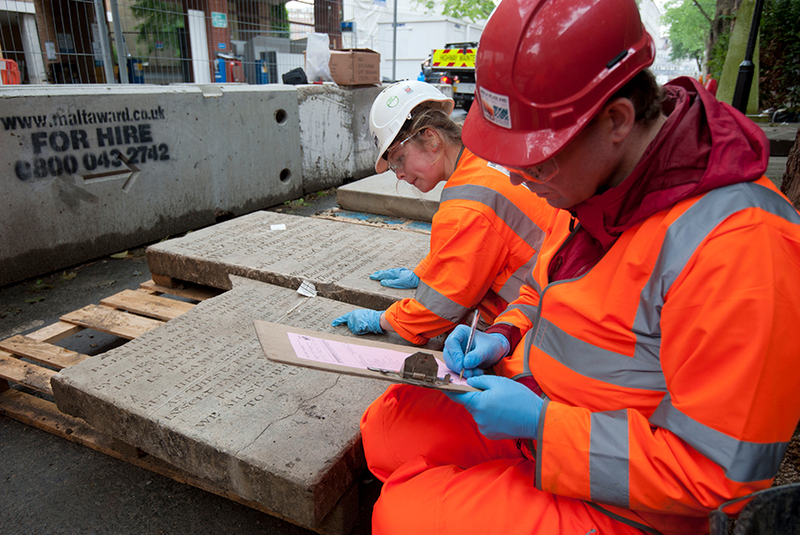 The archaeological programme at St James’s Gardens in Camden, London, is being carried out by our experts on behalf of Costain-Skanska Joint Venture for HS2 Ltd. To find out more about the programme visit www.hs2.org.uk for information on what is going in your local area or how you can get involved head to https://hs2ineuston.commonplace.is/. Explore the archaeology programme on social media with #HS2digs.